Dan Shugar, the CEO of NEXTracker, reveals more details about the company’s plans. NEXTracker CEO Dan Shugar has been a force in the solar industry for over 20 years. He spoke at a recent angel investor meeting in Silicon Valley, revealing more details about partnerships and market expansion. Shugar is two for three when it comes to startup exits. He was president of PowerLight when it was sold to SunPower for $332.5 million; and his solar tracker company NEXTracker sold to Flex for $330 million. After spinning out NEXTracker from Solaria, the firm has delivered more than 8 gigawatts worldwide in a few years. The DC-coupled flow battery system can store solar generation, as well as address the problem of "clipping" inverters that are unable to handle the plant's output at a given moment. In a blog post, Avalon Battery's co-founder Matt Harper suggested that the startup's vanadium-based flow batteries are more durable than lithium-ion and "can essentially live as long as the solar plant they’re integrated with -- 30 years or more." He added that energy can be shifted to generate more revenue, and that "much of the balance of systems and associated labor costs on the AC side can be greatly reduced as well." He called it the first "deeply integrated solar-and-storage system" and suggested the "era of renewable baseload generation may be closer than you think." We've tracked the flow battery industry for 10 years and have yet to witness any breakout commercial success. The entrants continue to battle the technical and cost issues of bringing this long-duration energy storage technology to scale and to market. For an account of struggles in the space, read this GTM Squared flow battery market survey from a year ago. Not that much has changed in the market since then -- although flow battery firms continue to raise money. ViZn Energy just raised another $1.9 million according to SEC filings, and Primus raised $32 million a few months ago. NEXTracker also has an option for a containerized lithium-ion battery system made by parent company Flex. According to Scott Moskowitz, solar analyst at GTM Research and the author of a recent report on the global tracking market, Arctech leads a small group of domestic and foreign vendors in India, while Scorpius Trackers and Mahindra Susten are the two leading domestic manufacturers. "Module price declines have dropped fixed-tilt EPC system prices to as low as $0.55/Wdc, which has reportedly pushed some projects away from tracking toward fixed and seasonal tilt," he said. Despite that mild headwind, NEXTracker has sold over 1 gigawatt of solar trackers to utility-scale power plants in India. "I've been going to India and trying to do solar there for 25 years. We actually made it happen 18 months ago. The market is really around big utility," said Shugar. Shugar noted that a large portion of the PV system’s material cost and weight comes from the steel tubes and piers that make up the core of any solar tracking system. NEXTracker has a steel-tube line starting up in India that will reduce logistics costs. The company claims that localization can cut shipment times by 50 percent. According to the Make in India program, India’s annual solar installations will grow to 10.5 gigawatts of utility-scale solar in 2017 and could account for 14 percent of global solar PV demand. India's National Solar Mission is targeting 100 gigawatts installed by 2022. "Global tracker market growth will be temporarily subdued in 2017, with growth at 19 percent, compared to 83 percent annual growth from 2013 to 2016 and 21 percent annually from 2017 to 2021," said Moskowitz. That's a "subdued" 19 percent in an off year for the industry. While tracking was not always easy to justify five years ago, Moskowitz cited the "overwhelmingly positive economics" of tracking today that have made it the obvious choice in large-scale solar. The market will top $4.9 billion in 2021, up from just under $1 billion in 2015. The tracker market is highly concentrated, both competitively and geographically. 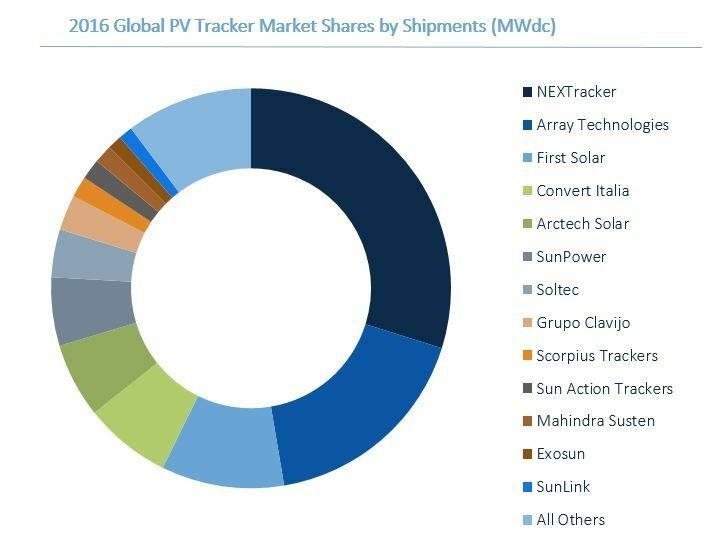 Array Technologies and NEXTracker are the market-share leaders in the tracker field, followed by First Solar and SunPower's "captive" business, along with Convert and Arctech. Other vendors grabbing small shares include GameChange, SunLink, Optimum Tracker and Solar FlexRack. GTM Research analysts have concluded that hardware vendors will compete on price, but they'll also have to provide an additional value to the engineering, procurement and construction provider -- either to reduce installation time or help reduce soft costs. 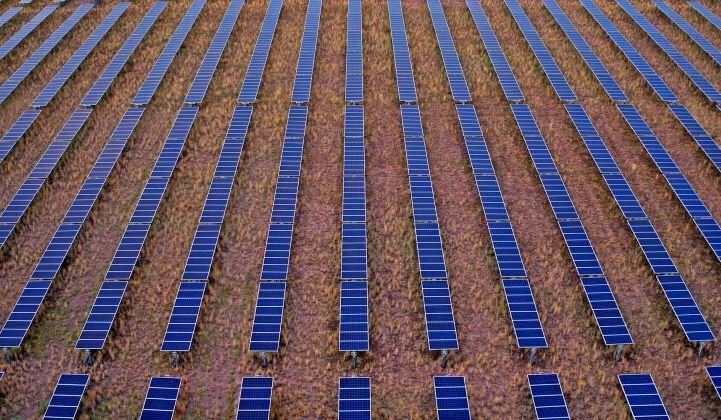 Trackers can improve solar output by 20 percent in Las Vegas and 30 percent in Chile, at a price approaching a single-digit premium to fixed tilt. Trackers can also provide a better match to utility load. The solar industry is in for an atypical "negative growth" year in 2017, but the solar tracker market will still experience a small expansion. Get access to all of GTM Research's solar balance of systems reports and data with the new PV Systems & Technologies Service.